Features. 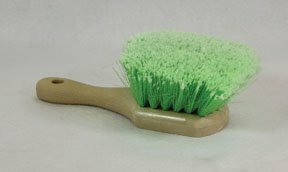 Size - 2 in.. green flagged tip polystyrene bristles provides for gentle washing of any surface.. Set in sturdy foam block.. Overall length 9 in. green flagged tip polystyrene bristles provides for gentle washing of any surface. Set in sturdy foam block. If you have any questions about this product by Hi-Tech Industries, contact us by completing and submitting the form below. If you are looking for a specif part number, please include it with your message.